Add Mickey decorations to a plain cupcake. More than a few Mickey Mouse cupcake ideas are out there, making this famous mouse an adorable and easy dessert for any child's birthday party. Mickey Mouse is a classic choice for a happy birthday cake, and making cupcakes featuring the loveable mouse are a great way to make things easy. Mickey isn't the easiest character to recreate in cupcake form, but with a little practice, anyone can make him. It can be tricky to make a true black fondant or buttercream. Consider first making a chocolate frosting and then adding black food coloring to the dark chocolate base. This technique uses less food coloring, does not run the risk of changing the taste of the frosting, and is less likely to stain teeth, lips or fingers. Make a batch of regular sized cupcake and miniature cupcakes. 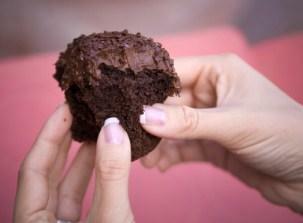 For every regular cupcake, there should be two mini sized ones. Place two mini cupcakes at the upper sides of the larger one, so they look like mouse ears. Frost all three cupcakes together with black buttercream frosting, or cover them individual in black fondant. Pipe pale beige buttercream for Mickey's face on the larger cupcake and allow it to set. Add Mickey's nose, mouth and eyes using buttercream or royal icing. With the addition of the two miniature cupcakes, this is a fairly sizeable dessert for children. Make sure you have plenty of party games and healthy food options for the rest of the party. 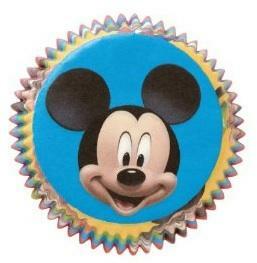 Instead of frosting the cupcakes individually, make a Mickey Mouse cupcake cake. Get a large piece of cardboard and cover it in parchment paper or aluminum foil. Trace a large cutout of Mickey's head onto the covered board and arrange cupcakes on the inside of it. Frost all of the cupcakes together, or frost them with a thin layer of buttercream and cover them with a large black rolled fondant cutout of Mickey's head. Add the rest of Mickey's face details using cut rolled fondant or piped buttercream frosting. Once the birthday boy or girl has blown out the candles, each child can take his or her own cupcake from this pull-apart cupcake cake. Have several decorated cupcakes place around the table where kids will be decorating. This way, they can reference the design to create their own Mickey face. Include the rest of the Mickey Mouse gang in your party theme, by adding Minnie, Donald, Daisy, Goofy and Pluto to the cupcake designs. Making Mickey Mouse cupcakes is a great way to incorporate a Mickey birthday theme into the party dessert.